"It's like a potato - a baked potato - a talking baked potato..."
"Now then Ross, don't be rude; you look a pink weasel to him. The Sontarans are the finest soldiers in the galaxy. Dedicated to a life of warfare." Poor old Sontarans - no matter what else they do it's the baked potato head everyone remembers. The Sontarans had a promising start, back in 1973's "The Time Warrior," with their sole representative Linx being ruthless, intelligent, deadly in a fight and nigh-industructible - and, unlike many Doctor Who monsters of old, didn't look like he was made of bubble-wrap and Sellotape. Unfortunately, while the Sontarans' ambitions advanced from the humble (providing advanced weapons to a medieval warlord in exchange for sanctuary while he repaired his damaged spaceship) to pretty much the ultimate (conquering Gallifrey - albeit only for about a day before Tom Baker kicked them off again), the quality of their makeup didn't - indeed, it seemed to go backwards, looking cheaper (and more like a potato) every time they turned up. Luckily the new series has a makeup budget of more than tuppence, so when the spuds made their bid for Earth - intending to terraform (Sontarform?) it into a hatching planet for their clone-based reproduction - they looked like they meant business. 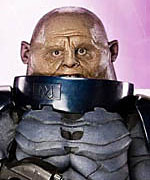 Sontarans as a race are short, stocky and powerful - like dwarfs without the beards - and have always worn padded armour/spacesuits, with heavy dome-like helmets, and the new incarnation of their outfits keeps these basic traits while updating the details: the suits, though still flexible padded material rather than rigid plates, are segmented and sophisticated-looking, and the helmets are joined by matching solid shoulder plates and belts. The suit is two-tone blue, dark and metallic for the solid pieces, blue-grey for the flexible layers - the figure has paint applied to the crevices between segments, to bring out the sculpted detail. There's a lot of mix-and-match going on between plastic types - the upper torso is soft (although it's glued in place over a solid core that matches its shape, so the Sontaran isn't squishy), and matches the solid limbs well in colour and tone. The shoulder armour is flexible too, to allow the upper arms to move easily, and doesn't quite have the reflectivity of the hard plastic helmet, although it's a good attempt, and not something you notice unless you put the figure under a strong light. 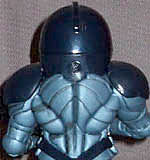 Besides the suit's inlaid design, there are numerous small bits of detail on the figure, including a wrist-mounted communicator, a blaster unit on the belt, clips on the sides of the abdomen holding the front and rear torso plates together, and on the back of the neck, the probic vent, a Sontaran's only weak spot. True to form, the figures are shorter than average for the Doctor Who line - not comically so, but at just over 5" they're a bit below most humanoids, and dwarfed by such looming monsters as Cybermen and Ice Warriors. There are, to my knowledge, three variants of Sontaran figure around - two of them were in the wave that made it to Australian shores, the basic trooper and Commander Skorr, General Staal's second-in-command (i.e. the guy who's there so the bad guy can tell the audience what he's doing without looking like he's talking to random mooks); Staal himself, sadly, never made it here. The trooper is simply a headless figure with the helmet glued in place - the eye slits are transparent, but being so small they don't let in enough light to see that there's nothing inside. 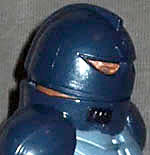 Skorr gets a real head - also glued in place (Sontarans don't turn at the neck) - and also has a different version of the neck ring that supports his (removable) helmet, bearing a replica of the crown-like Sontaran emblem, marking him as an officer (Staal's General insignia has extra points). The face captures Skorr well, even down to the little Madonna gap between his front teeth, which is just as well since helmet-on isn't a good option for him - the fit is so tight that, at the merest bump, it tends to pop out of its housing at the back. Facing the enemy "open-skinned" - sans helmet, not naked, thankfully - is an honour for Sontarans, so he's probably happy about that. Besides the absence of a neck, the Sontarans are at the top end of mobility for Doctor Who figures, with swivel/pin shoulders, swivel biceps, pin elbows, swivel wrists, balljoint waists, swivel/pin hipe, swivel thighs, pin elbows and balljoint ankles. Stuck with their inability to turn their heads sideways they can't really do a proper rifleman pose, with their gun in both hands and facing down the barrel, but they can do damn near everything else. As is always the case, the hips and thigh swivels are high-visibility, since there's nothing in the costume design that could help hide them - less to the biceps, being mostly in the shadow of the shoulder armour - but the other joints are very low profile, so the net effect is quite positive for a highly articulated figure. Aside from Skorr's removable helmet, the only accessory the Sontarans have is their trusty laser gun, a chunky rifle with circular grips at the middle and rear. 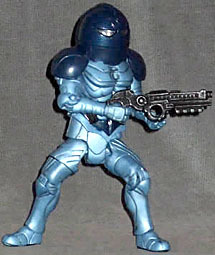 The figure's three-fingered hands are sculpted to hold the rifle right-handed - being clones, presumably there aren't any left-handed Sontarans - with the right hand a very snug-fitting tripper grip, and the left an more open hand to support the barrel, rather than fit into the secondary grip. The rifle is a single piece, cast in black with a lightly-applied silver drybrush giving it highlights. It has to be admitted, there's something fundamentally unglamorous about the Sontarans - despite their record in combat (and aside from still not being able to defeat the Rutons in the mutual kill-fest the two races have been engaging in for at least 50,000 years, they've avoided any real humiliations during their episodes), they don't quite catch the imagination the way the Daleks and Cybermen do. Still, aided by good writing and acting, the new-look Sontarans manage a bit of coolness, of the ugly-but-kickass kind (again, like dwarfs). These figures really are everything that could be asked of them, with the high standard of accuracy and detail typical of Character Options' work on Doctor Who, and unparalleled articulation in the line. They're a worthy addition to any collection, and Sontaran fans - and there are a handful, among the show's serious devotees - will be over the moon.